The life of renowned Canadian artist Ted Harrison will be celebrated in Victoria on Saturday as family and fans gather to remember the man who left behind a legacy of vibrant, whimsical art largely based on the landscapes of the Yukon. Harrison died in Victoria on Jan. 16. He was 88 years old. The artist was born in England and studied art and design there before heading off to travel the world as a teacher. Eventually, Harrison and his family moved to Canada, and to the town of Carcross, just outside Whitehorse, Yukon. There, Harrison rediscovered his love of painting and began to create northern landscapes. 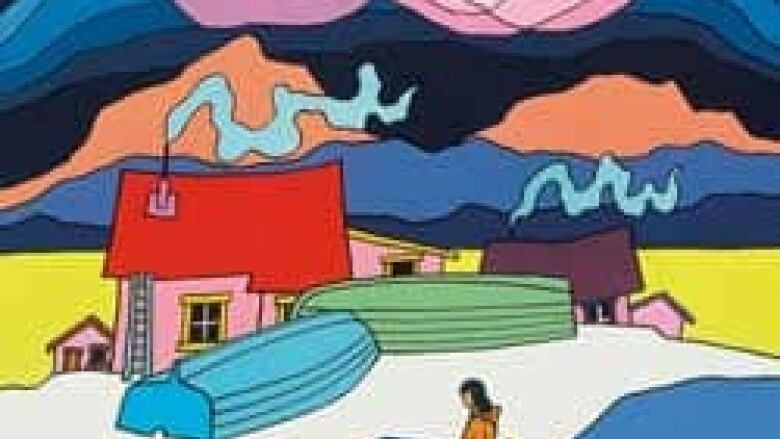 His paintings are known for their vivid colours, skies filled with lines, swirls of energy and light, parka-clad people with sleds and dogs, and whimsical homes. "He would go out walking and he would see something or feel something or notice a colour and an image would pop into his mind," said Robert Budd, who wrote the introduction in the new book, Ted Harrison Collected. "And he was such a master that he could go home, paint it, and get completely out of the way and let it come through him, and you could feel his personality and the joy in his craft come through in every single one of his images." Budd says part of Harrison's legacy is bringing the Yukon to life for many people who have never visited. The celebration of Ted Harrison's life will take place on Saturday from 1:30 to 4:30 p.m. PT at the University Club at the University of Victoria. All are welcomed.